Asa (Hebrew: אָסָא, Standard Asa Tiberian ʾĀsâ) was the fifth king of the House of David and the third of the Kingdom of Judah. He was the son of Abijam, the grandson of Rehoboam, and the great-grandson of Solomon. Asa's grandmother was Maacah, the daughter of Absalom. William F. Albright has dated his reign to 913 B.C.E.- 873 B.C.E., while E. R. Thiele offers the dates 911 B.C.E.- 870 B.C.E. Asa reportedly won an important victory over Egyptian forces to the south and later forged a military alliance with Damascus that enabled him to resist pressure from King Baasha of Israel. In matters of religion, he was the first king to carry out a strict "Yahweh-only" religious reform that repressed Canaanite religions, even deposing his own grandmother, Maacah, because she was a worshiper of Asherah. I Kings and II Chronicles thus describe his reign in a favorable manner. They both give his reign as 41 years. Asa was the father of Jehoshaphat, one of the more successful kings of Judah. His lineage continued to reign in Jerusalem until the Babylonian Exile, and he is considered to be one of the ancestors of the future Jewish Messiah, as well as of Jesus Christ in the Christian tradition. Asa lived during the first stages of the Divided Kingdoms, when the unified monarchy under Solomon had been split in two by the successful northern rebellion of Jeroboam I. The Davidic dynasty under Solomon's son Rehoboam remained in control over the southern Kingdom of Judah, while Jeroboam reigned over the northern Kingdom of Israel. According to the biblical account, Jeroboam's rebellion had been sanctioned by God through the ministry of the prophet Ahijah of Shiloh. However, Jeroboam earned the prophet's disapproval for establishing allegedly idolatrous sanctuaries at Dan and Bethel that competed with the Temple of Jerusalem. Although the prophets warned the kings of Judah against military actions against their northern brothers, wars did break out. 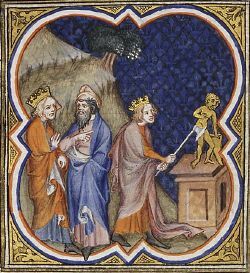 During Rehoboam's reign, Judah suffered as a result of the north's friendship with Egypt, and Jerusalem was sacked by the Egyptian king Shishak. After Rehoboam's death, his son Abijam (also called Abijah) succeeded in winning back several northern towns, in part through an alliance with Israel's enemy, the kingdom of Damascus (Syria). Although generally favoring the south against the north, the biblical writers disapprove of both Rehoboam and Abijam, as well as Solomon himself, for not being zealous enough in promoting the "Yahweh-only" tradition of the Jerusalem priesthood. That situation changed under the reign of Asa. Our sources concerning Asa's rule are found in the books of Kings and Chronicles. The accounts are heavily biased in favor of Judah versus Israel and do not completely agree in their assessment of Asa. The account of Asa's reign in Chronicles is considerably more detailed, but is thought to have been written later, using Kings as one of its sources. It also makes Asa appear to be a much grander figure than does the Book of Kings. According to Chronicles, Asa's reign began with an impressive building program to fortify the towns of Judah. He also carried out a program to promote Yahweh-worship and destroy the shrines of other deities. Chronicles states that Asa also removed the high places, although the account in Kings specifically says otherwise (1 Kings 15:14). Kings also adds that he expelled the male shrine prostitutes from the land and destroyed the idols that "his fathers had made." Chronicles gives the size of Asa's armies as 300,000 men from Judah and 280,000 from Benjamin. The figures are probably exaggerated, as archaeological evidence suggests that Israelite armies of this size were not present in the area in the tenth century B.C.E. In any case, the text relates that Asa's forces fought a major battle against the vast army of "Zerah the Cushite," an apparent reference to Egyptians of the Upper Nile region. Asa's army won the day and drove the invaders back to the Philistine town of Gerar. His men also took a great deal of plunder from the territory the Cushites had controlled. Some of the treasure was dedicated to the Lord and later installed in the Temple of Jerusalem. Chronicles next describes the ministry of prophet Azariah son of Oded, and Asa's response to it. Azariah exhorted Asa to reinforce strict national observance of worship of Yahweh only. Asa responded by purging the land of religious worship not devoted to Yahweh. The sites of non-Judaic worship were destroyed and the worshipers persecuted. One of the victims of the purge was the Queen Mother, Asa's grandmother Maacah, who was deposed for having erected an "Asherah pole." Finally, when the religious transition was completed in Asa's fifteenth year, a great feast was held in Jerusalem at Solomon's Temple. At that time, many northerners, particularly from the tribes Ephraim and Manasseh, reportedly migrated to the Kingdom of Judah. Others no doubt came on temporary visits to the Temple in Jerusalem for the purposes of pilgrimage. A map showing the divided kingdoms of Judah and Israel (click to enlarge). Although the Book of Kings states that "there was war between Asa and Baasha king of Israel throughout their reigns," Chronicles takes the view that Asa's religious piety resulted in a long period of peace, indicating that "there was no more war until the thirty-fifth year of Asa's reign." Around this time—although the sources differ as to chronology—King Baasha of Israel brought a force close to Jerusalem and fortified the town of Ramah, seeking to prevent further immigration and pilgrimage to Jerusalem. With his capital under pressure, Asa took "all the silver and gold" from the Temple and his own palace and sent them to Ben-Hadad I, King of Damascus, as a bribe to induce him to break his peace treaty with Baasha. Ben-Hadad complied, attacking several key northern cities and forcing Baasha to withdraw from Ramah. Asa instituted a nationwide draft from which "no one was exempt" and tore down the unfinished fortress, using its raw materials to fortify Geba and Mizpah, on his side of the border. The prophet known as Hanani the Seer, however, admonished Asa for relying on foreign help as opposed to divine aid in defeating Baasha. Hanani predicted that Asa would remain at war for the rest of his life as a result. Asa reacted by imprisoning Hanani in jail and allegedly "oppressed some of the people" in an unspecified way. No additional battles are related in the text, but Chronicles reports that Asa developed an infection in his toes that later spread to the rest of his body. Because he consulted doctors as opposed to the Lord for a cure, the disease only grew worse. He died after 41 years as king and was buried with great honor in Jerusalem. Asa was succeeded by his son Jehoshaphat, who ended the war with Israel and formed an alliance with its powerful kings, Omri and his son Ahab. The biblical authors speak highly of Jehosaphat for the most part, but criticize him for allowing his son to marry Ahab's daughter Athaliah. She would later become Judah's reigning queen and carry out a bloodbath in retaliation for the murder of her own family by the Yahwist zealot Jehu of Israel. Asa's lineage, however, would survive Athaliah's purge and thus continue the Davidic dynasty until the Babylonian Exile. According to the rabbis, Asa was distinguished by his perfect feet, which were as beautiful and strong as those of Adam. He was later afflicted with gout because, when enlisting the whole of Judah in military activities, he "exempted none" (I Kings 25:22). This means he forced the Torah students and even newly married husbands—whom the Law exempts (Deut. 20:7)—to march (Soṭah 10a). In obtaining an alliance with the king of Syria against Baasha by giving away the gold and silver treasures of the Temple (I Kings 25:18), Asa sinned grievously, for which Hanani sternly rebuked him (Tosef., Soṭah, xii. 1, 2). Among the treasures which Asa took from Zerah the Cushite—and which Zerah had taken previously from Shishak—there was the marvelous throne of Solomon upon which all the kings of Judah subsequently sat. While the other great treasures were given by Asa to the king of Syria to obtain his alliance, these were soon captured by the Ammonites, and then recaptured by Jehoshaphat. They then fell into the hands of the Assyrian king Sennacherib, from whom Hezekiah recovered them. During the capture of Jerusalem, they came into the hands of the Babylonians, then into those of the Persians, then the Macedonians, and finally of the Romans, who kept them at Rome (Pes. 119a). The books of Kings and Chronicles differ significantly in their assessment of Asa. Although both generally approve of him, Kings begins by pointing out that he did not dismantle the high places, while Chronicles insists that he did dismantle them. Defenders of the biblical text resolve this seeming contradiction by pointing out Chronicles admits that Asa did not remove the high places from the northern kingdom, while critics insist that since Asa was not the king of Israel, there is no reason to suppose that he could have done so. Chronicles also presents him as a great builder, while Kings makes no mention of his building projects. Kings portrays him as perpetually at war with Baasha, while Chronicles speaks of a long era of peace, a blessing that resulted from Asa's purge of Canaanite religious shrines. While Chronicles speaks of his mighty army, Kings presents him as a relatively weak military power whose only success came through his using Temple treasure to bribe Ben-Hadad of Syria to break his treaty with Israel. There are also serious contradictions between Kings and Chronicles in terms of their chronologies, making the history of Asa's reign difficult to reconstruct. For example, in Kings it says "in the thirty-first year of Asa king of Judah, Omri became king of Israel." (1 Kings 16:23) Chronicles, however, has Baasha—not Omri—still reigning at this time, reporting: "In the thirty-sixth year of Asa's reign, Baasha king of Israel went up against Judah and fortified Ramah." In addition, the writer of Chronicles seems to indicate that there were two separate religious reforms instituted by Asa, but since he basically retells the opening lines of Kings for the first one, it may be that that one only occurred. "Zerah the Cushite" presents another issue. The traditional view was to consider this Zerah to have actually been the Egyptian king Osorkon II or Osorkon I. Osorkon II, is known from other sources to have entered the Kingdom of Judah with a large army in 853 B.C.E. However, rather than attacking Judah, the army was just passing through, on its way to engage the Assyrian forces. In addition, Osorkon II's reign seems to have begun after Asa's reign had already ended. As one of the early Davidic kings, Asa left a long legacy through his lineage, ending as a monarchy with the Babylonian exile, but continuing in Jewish tradition in the hope for the coming Messiah. In Christian tradition, Asa is one of the ancestors of Jesus. In his own time, Asa was a pivotal figure in that the biblical writers see him as the first king since David who was approved by God. Indeed, the Bible portrays the blessing of God as having rested temporarily with the northern king Jeroboam, and it may be inferred that it was Asa who succeeded in returning God's support to the south. ↑ This account in Kings, however, may refer to events which Chronicles relates later in its version of events. Albright: 913 B.C.E. – 873 B.C.E. Thiele: c.911 B.C.E. – 870 B.C.E. History of "Asa of Judah"